NYJO's summer calendar in the past two weeks has been full of interesting ventures and adventures. The main band has been in Milan and in Cheltenham, and also had a guest workshop in London with saxophonist Bob Mintzer of the Yellowjackets. 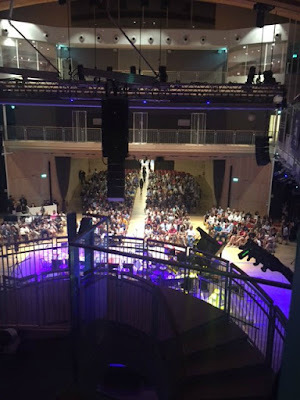 LondonJazz News: Nigel, I gather NYJO has just been in Milan - what was the context / festival? Nigel Tully: One of Italy’s largest banks, UniCredit, organised a six-concert Festival of European Youth Orchestras in Milan, using Concerto Management (who represent the LSO in Italy) as curator. They decided to book four classical orchestras, a folk band, and a jazz big band - and they chose NYJO for that role. LJN: And it sounds like quite a space for the band to perform in? NT: It was amazing! The UniCredit Pavilion is a 700-seater in a modern square in Milan a bit like Canary Wharf - very impressive and somehow very Italian. There were huge screens outside and - despite a torrential downpour 2 hours before the gig - there were thousands watching the gig outside as well as a full house. LJN: And I understand it is quite a feather in NYJO's cap and a first in some ways? NT: Yes, indeed! We were the only British orchestra and the only jazz ensemble out of six - the others were from Poland, France, Italy, Romania, and Slovenia. We were very pleased to be representing Britain in Europe so soon after Brexit - Mark Armstrong got a roar of appreciation when he said so in fluent Italian! The other wonderful thing was that it was a genuine commercial gig, with a professional fee and the band looked after as they deserve rather than having to scrape by with an inadequate budget, which has always been NYJO’s experience on previous gigs around the world. I think Mark and the band can take great credit for being chosen as Europe’s best on this occasion. LJN: And the band played with Fabrizio Bosso - for the uninitiated can you explain who he is and how did all that go? NT: He is an absolutely superb trumpeter - amazing technical facility, and lovely artistic sensitivity as well. We played some of his stuff, he played some of ours, and it all sounded like he had been playing with NYJO for years. On one of his solos the entire NYJO trumpet section were visibly amazed at his playing - nudging each other open-mouthed to say “How did he do that?”! LJN: What was the programme for the concert? NT: Three of Fabrizio’s originals, five standards including a marvellous ‘Round Midnight’ and two NYJO originals, including ‘Have You Seen Them Cakes?’ on which Mark got all five NYJO trumpeters down to the front row to trade eights and then fours with Fabrizio, and then the trombones as well. That was the point at which the Italian crowd understood that NYJO is not only a superb big band, it is also packed with top class soloists. LJN: And did the Italian crowd take to NYJO? NT: All I can tell is that the band had to play an encore (‘Feelin’ Good’ of course) and Concerto Management want to discuss an Italian tour for NYJO in 2017, so I think we can safely say it went well. My Italian friends who were there were absolutely knocked out - there is nothing like NYJO in Italy, but hopefully we will help to get an Italian version started one day. LJN: Jonathan, can you tell us about the recent Cheltenham project and the story behind it and what got played? Jonathan Carvell: NYJO was performing in Cheltenham with the National Youth Chamber Choir, in a special joint programme of music inspired by Shakespeare. 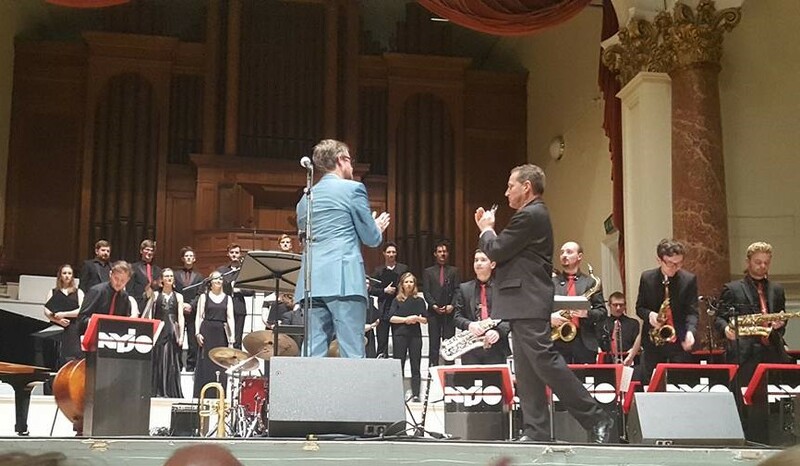 The collaboration was conceived for the 2015 City of London Festival, mainly alternating between jazz band and choir, but occasionally with both together, and received rave reviews. Since then we’ve broadcast from the Hackney Empire for BBC Radio 2 Friday Night is Music Night on the anniversary of Shakespeare’s death. The collaboration is currently going on tour across the country. The next performances will be at Petworth Festival on 29 July, followed by Stratford on 22 October. There is a TICKET LINK for Petworth. The concert in Cheltenham included the premiere of ‘Food of Love’ a brilliant new piece written by NYJO’s MD and Artistic Director Mark Armstrong. We also played Pete Churchill’s ‘Journey’s End’, commissioned specially for NYJO and the Choir to perform together - so we’re presenting brand new responses to Shakespeare alongside classics like Duke Ellington’s ‘Such Sweet Thunder’. LJN: I'm also hearing that the main NYJO band also had some time with Bob Mintzer - how did that go? 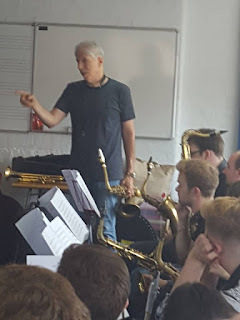 JC: Bob Mintzer came to work with NYJO on Saturday morning, in between his two sold-out gigs with the Yellowjackets at Ronnie Scott’s. NYJO rehearsed Bob’s tune ‘Land of Oak’ (from his 2015 album ‘Get Up!’), learning the piece from scratch in around 90 minutes. Bob spoke about the piece’s roots in the Oakland R&B scene (with influences from Tower of Power and Graham Central Station etc.) and gave some great insights into how to approach the chart; he also played some blistering solos with the band! NYJO had a gig at Deal Festival that evening and performed Bob’s chart as part of the show – it went down a storm. Bob was pretty impressed with how quickly the band took this very challenging piece on board. 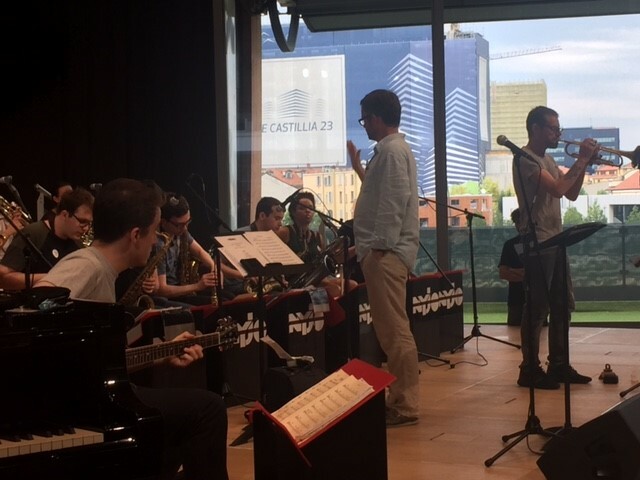 There is also a video on our NYJO Youtube channel of the band rehearsing ‘Land of Oak’ with Bob Mintzer.